This month, two different (albeit related) news have been echoed by the Web and scientific journals. The 13th of April, Working Group 3 from the IPCC (Intergovernmental Panel on Climate Change) released a new report concerning “mitigation of climate change”. Somehow, the title summarizes at its best what is heavily shown in the attached pages : despite previous reports and international forums (including the Kyoto protocols), anthropogenic emissions of greenhouse gases have continuously increased in the time-lapse taken into account by the report (1970-2010). Moreover, it is shown that when you consider all CO2 emissions (cumulative) between 1750 and 2010, half of them occurred in the last 40 years, reaching a pick in 2010 (being only slightly affected by the world economic crisis in 2007/2008). The report goes on with possible scenarios and trends on global temperatures (supposed in the range +3.7°C <-> + 4.8°C in 2100, assuming no efforts to reduce emissions). Rapid climate change seems almost inevitable ; the point is not how to stop it, but how we can adapt to such effects. The report provides different pathways to cut emissions and mitigate climate change. Several technical solutions are illustrated, spanning from CO2 capture to nuclear power or bioenergy. Some economists frankly noticed that, if IPCC suggestions have to be implemented at the political level, this will not be without effects on economical exchanges (and the current trends of market competition)  . The scientific community, by the voice of the journal Nature, simply titled “IPCC report under fire”  where the absence of country-specific guidelines for lowering emissions was questioned. Therefore, the simple message that CO2 emissions should be reduced seems unsatisfactory because lacking of tangible and pragmatic ways of implementation. This is a classical problem for science when confronted with society. The second news is inspiring and comes “in resonance” with the IPCC and global change. At the Science Museum in London, an exhibition about the life and work of James Lovelock opened this month. James Lovelock is probably one of the most eclectic scientists today (a “natural philosopher” of the XXth Century, much like Stephen Jay Gould or D’Arcy Thompson in other fields). Lovelock is well-known for the theory of Gaia (a name suggested to him by William Golding , yes, that William Golding), also known under the metaphor of the living Earth. He first developed the theory while working at Nasa on the question of how to reveal the presence of life forms on Mars. This resulted in the idea that life could be revealed by analyzing the planet atmosphere : if an atmospheric disequilibrium was found, that is the footprint of life at work. This is indeed the case with Earth, making our world a “living” planet. These reflections inspired the first version of the Gaia theory. As Lovelock says , the theory of the Earth as a living organism or, better, as self-regulated system, was challenged by scientists like Dawkins and Doolittle, with the argument that the unit of natural selection is the organism, not the biosphere. The new model was called “Daisy World”. Lovelock imagined a planet populated with “daisies” existing in two different colours : white or black. The planet would self-regulate its own temperature as white daisies will be the fittest in a hot climate, and the opposite for the black ones, in a cold climate. This model was pure abstraction. However, it revealed for the first time that a self-regulating planet was indeed possible (at least theoretically), and paved the way to find out real feed-back mechanisms of climate homeostasis on our planet. Lovelock has just published his new book : “A Rough Ride to the Future” , where the role of man in Gaia is positively re-evaluated, compared to his previous books. Probably, more than that, the book contains its legacy for this century. In a recent interview by Philip Ball in Nature , that I found inspiring, Lovelock is asked to explain his concept of “sustainable retreat” regarding climate change. He argues that lack of food during WWII almost led Britain to defeat and, mutatis mutandis, today’s agricultural supply is not in line with the needs of the world population . Therefore, Lovelock was clearly pointing to agriculture at the heart of the sustainability problem. 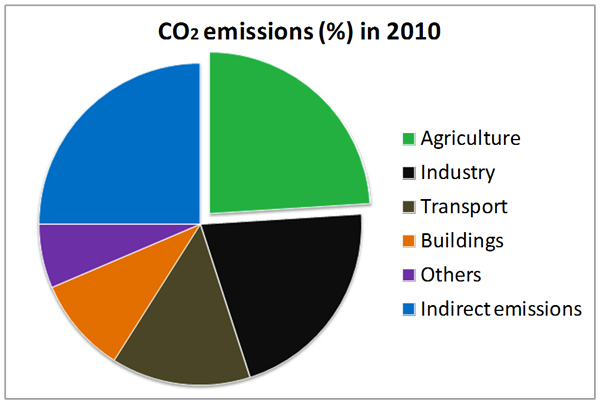 This is interestingly matching with this resuming graph for the IPCC report , illustrating the percentage of direct CO2 emissions in 2010 for different sectors (indirect emissions account for 25% of the total) : agriculture (along with forestry and other land use) emitted 24% of total CO2. Industry was second for direct emissions, at 21%. Maybe we should start to solve the problem in the right order, starting with A (A, as Agriculture), instead of C (C, as Climate) and follow Lovelock : “it is far better to think about how we can protect ourselves” . Sylvestre Huet, ‘L’objectif des 2°C échauffe les esprits’, Libération, 15 April 14AD, p. 17.